Very recently there have been reports of Linux's market share being less than 1%. Though I personally believe it is 100% false, statistics force one to trust the information. The reason for this may be lack of a single channel to register oneself as a Linux user. Using free software does not mandate registration. Conceptually it's good but other's take advantage of the available statistics to show that the user base is too low to innovate in these platforms. Fortunately for a user of GRASS GIS that is not the case. 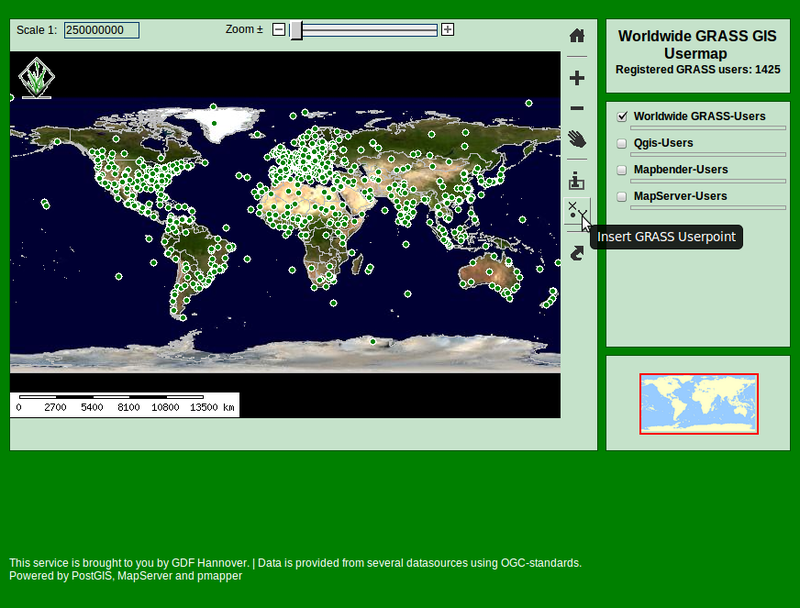 We are given the facility to register ourself in the GRASS GIS Worldwide Usermap in very simple steps. Currently the map says there are only 1425 registered users which I find hard to believe, as GRASS will have far more number of users than that. Therefore its my personal appeal to all GRASS GIS users to take some time and register yourself in the GRASS GIS usermap. You just have to zoom to your area and click "Insert GRASS Userpoint". You are given the facility to enter your name and organization and even allowed to modify the coordinate information if necessary. Let's show that we are a big and active GIS community.